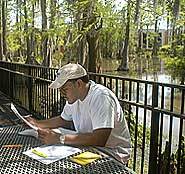 UL Lafayette will be holding an information session for anyone interested in Graduate School. This “Guide to Graduate School” will take place Wednesday, Nov. 19 at 3 p.m. in the Student Union Art Gallery located on the first floor of the Student Union, across from University Bookstore. The session will discuss topics such as: what is Graduate School, why should you apply, how and where to apply and when you should start considering Grad School. The event is sponsored by UL Lafayette’s Graduate School, Junior Division and Career Services. For more information, contact UL Lafayette’s Graduate School at 482-6965 or Career Services at 482-1444.